The high monthly increase seen by Seattle on the S&P CoreLogic Case Shiller Home Price Index held relatively steady from March through April 2018, from 2.8% to 2.7% respectively. This was the first instance of back-to-back monthly index gains of more than 2.25% since May 2013. It was also enough to expand the year-over-year advance to 13.1%, bringing Seattle’s nationwide lead to 20 months—second-longest in the history of the index. 215 W Garfield Street, Seattle This charming "top-of-the-hill" home has its original character, soaring ceilings, quartz counters, stainless steel Wolf range, Liebherr refrigerator, hip light fixtures, a wrap-around deck, and a finished basement with large recreation room Handsome curb appeal with a garden! Offered at $899,000. 1571 Parkside Drive E, Seattle Available for the first time in over 35 years, this easy-living home is sited on the sunny west fairway on an expansive 23,000+ square foot lot. Sited discreetly away from the street and accessed via a circular driveway, this home offers both privacy and handsome curb appeal. Offered at $3,600,000. Sotheby’s International Realty Affiliates LLC recently announced that it has entered a custom-publishing relationship with Dow Jones Media Group to present RESIDE®, a bespoke luxury lifestyle magazine. The first-of-its kind relationship gives Sotheby’s International Realty® affiliate companies around the world a turnkey solution to publish a customized, branded magazine created by the Dow Jones Media Group. 1321 Seneca Street #803, Seattle A high-impact yet timeless interior with top-of-the-line finishes include 9-foot ceilings, quartz countertops, stainless steel appliances & beautiful hardwoods all set against a canvas of sparkling city views. Offered at $795,000. 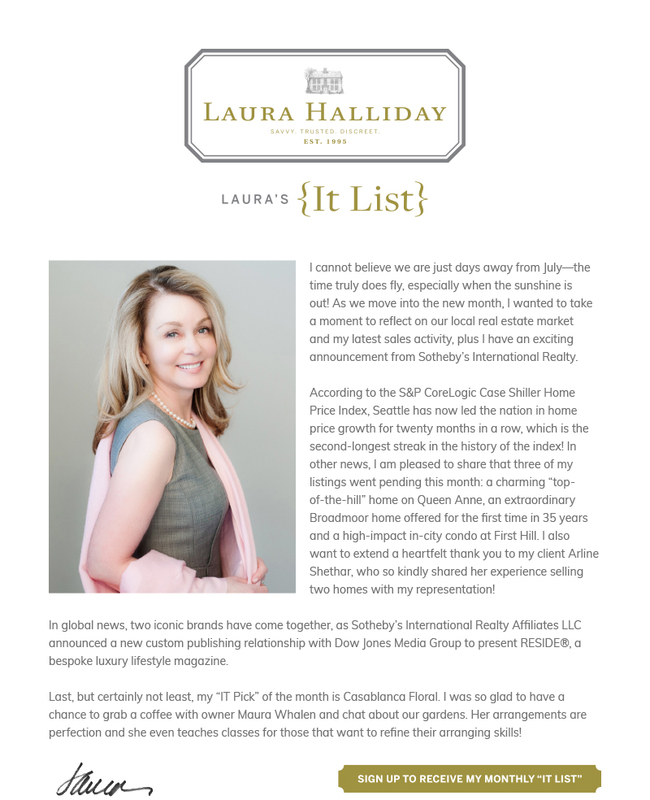 "Laura Halliday is the best high-end residential real estate agent you will find in the Seattle area. She has tremendous energy, knowledge, and taste and will take care of your needs and desires if you are a buyer and your dream home exists in the NW. If you are a seller she will sell your property within a short period of time if you follow her advice. I had two expensive properties in Seattle. One was listed for four years with another highly recommended agent. Once I listed with Laura, she had it staged (expensive but worth it, it seems) and sold the aging one within a few months and the other in three. Please call me if you have any questions. Laura has my telephone and gratitude forever. Not only did she sell both properties quickly, she kindly helped with a property problem eight months after the sale." My It Pick for the month of June is Casablanca Floral, located in Seward Park. Using only the freshest botanical ingredients, the boutique floral design studio carefully considers the recipient, occasion, and space when sourcing and creating floral arrangements. The owner of the business is Maura Whalen and she is just lovely. I recently had the privilege of discussing gardening with her over coffee at the Starbucks in Madison Park (see the photo of us above)! She traces her passion for flowers to her Italian grandmother in whose garden she used to play. If you are looking for an elegant flower arrangement for a special occasion, I highly recommend Casablanca Floral.